Jeanette Pierce was feeling a little tired the other morning. Then she got to talking. About Detroit. Before we go any further, let’s get a few things off the table. Yes, Pierce lives in Detroit, and yes, she “loves” it. But, no, she’s not stuck here. No matter what the critics say. 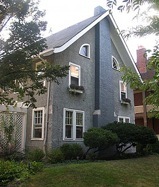 This past fall, TIME bought a house (right) near downtown Detroit. There, a bevy of journalists camp out in between reporting on the city. So, why the media fixation? The country’s economic and innovative potential — its middle class — largely started here. Then, came the decline. The 1967 riots. The foreign automakers. And the jokes that keep on coming. Like the other night on Conan O’Brien. None of which shakes Pierce’s belief in the city — or her passion for sharing its story. She’s a third-generation Detroiter (her great-grandparents settled in the area, from Poland.) 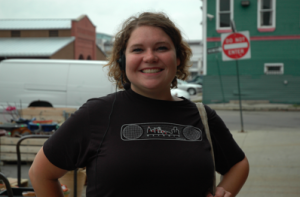 Along with fellow Detroit native Maureen Kearns, Pierce started a tour guide company, Inside Detroit, four years ago and, get this, 2009 was the company’s best year yet — yes, the same year that brought us more news of the Big Three Auto bailout and a terror attack on a US flight to Detroit. 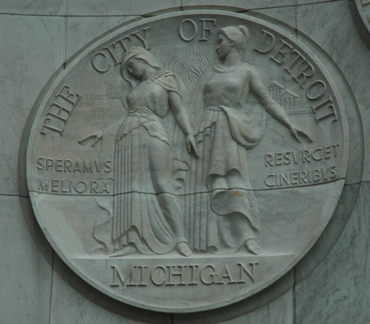 Detroit's motto since 1806: "We Hope For Better Things; It Shall Rise From the Ashes." American Detours: What gave you the idea to start Inside Detroit? Jeanette Pierce: In 2001, I studied abroad in Malaga, Spain. Living in a downtown community where you have access to people and culture showed me the possibilities of walking all over a city. So, when I came back to Detroit, my love for the city — and my desire to live downtown — made me fall in love with the city all over again … the history, the architecture, the small businesses thriving downtown. There wasn’t a great venue for other people to learn those types of things, though. Then I met my business partner, Maureen Kearns. She had realized something similar. American Detours: What are some surprising finds in Detroit? Jeanette Pierce: Our architecture. Minoru Yamasaki, who designed the World Trade Center, was in Detroit early in his career; he did a skyscraper here that is similar to the World Trade Center. The Guardian Building, one of the most beautiful buildings in the entire country, is here. Campus Martius Park was voted fourth best public square in North America. American Detours: What are some misconceptions about Detroit? Jeanette Pierce: That if you come to Detroit you’ll get shot. Downtown Detroit actually has 37 percent less crime than the national average. There are more businesses opening up than I keep up with. In the last year, we’ve had several projects including Westin Book Cadillac Hotel, a $200 million restoration of a historic hotel and the opening of Iron Chef Michael Symon’s Roast Restaurant. American Detours: What lessons does Detroit hold for the nation? Jeanette Pierce: One lesson is to reverse sprawl. Detroit is booming. We have people moving here to build urban farms, anyone can come here and live their dreams. That’s only because people ignored it for so long. There’s 125 bars and restaurants in the one-square mile of downtown Detroit. We have only one national chain, Hard Rock, and even there my best friend from high school is head of sales. So, what’s making Detroit thrive is that we have the strongest sense of community. American Detours: What’s next for Inside Detroit? Jeanette Pierce: 2009 was our best year, and 2010 has already started with a bang. We’re about to hire six to eight people. We’re also a 501(c)3 nonprofit. We recently got our first grant through the Hudson Webber Foundation. They have an initiative: 15,000 new residents of greater downtown Detroit by 2015. We’re working with them on that. American Detours: You’re offering tours throughout the North American Auto Show. Jeanette Pierce: Yes, we’re offering tours to any journalist. We’ll personalize the tours, and show them the “dying city” they so desperately want to find. But we know, when they’re done, they’re going to have a whole new perspective on Detroit. We’re also doing a public bus tour and a pub crawl. But we warn you: Be prepared to fall in love and want to move here, because that happens a lot.